Many start out life with no real conception of a life purpose. In fact most people go through a significant portion of their life wanting only to satisfy their own personal desires. These desires are usually ego driven such as the accumulation of wealth or material possessions, or to rise to a position of power or recognition. This life purpose may also include wanting to satisfy a host of physical bodily desires. Finding purpose in life is something we eventually arrive at when most of those other desires are fulfilled. Once all those other desires are fulfilled people find they are still left with a certain emptiness. In other words, they find out fulfilling all their physical desires did not bring lasting happiness, contentment, satisfaction or sense of fulfillment. Its not hard to see how our life purpose can take a back seat to life activity; whether we are conscious of it or not. In the above example every hour of waking life is taken up. Since there is only 168 hours in a week and assuming 7 hours of sleep per night, one is left with 119 waking hours (less if you sleep more than 7 hours.) The above activities consume those 119 hours per week. So if you truly want to get the benefit of this exercise, then I encourage you to write down your own list before you read further. I have given you the above list as a good starting point so you don’t have to recreate too much. Change the hours, delete or add to the above list and you will finish this exercise quickly. It is important to have some idea before reading further. So here is the exercise to help you put your life purpose into context. Suppose you were told you could only pick 2 items on that list to do for the rest of your life. Assume that food and shelter are provided because this is not an exercise to determine what is necessary to sustain the basic functions of life. Instead we are talking about what you want to do with the rest of your life and the rest of your time on earth. These two activities would be the only two things you could experience for the rest of your days on earth. What would those two things be? Below is a list of things to ponder as you look at your life’s activities. In which of these items are you living your life by watching other people live their life? In which of these activities are you expressing your true self or your passion in life? Which of these activities are necessary to sustaining your life? Are you doing any of these activities because you are bored and have no other priorities or other things to work on? Is there anything you desire as a life purpose on this list? Have you suddenly realized you don’t really have a life purpose? Have your realized what you really want is not even on your list? Are one or both picks grouped into the miscellaneous list representing the fewest hours spent each week? When do you define your life purpose? You life is moving past your very eyes. It was only yesterday you were in college or in school. It was only yesterday you were goofing around with your friends or holding your baby. It was just yesterday you moved into your first apartment or bought your first house. You may find your life to this point has been filled mostly with routines and activities. These activities and routines fill the space of what could be a life purpose. Given the trajectory of your life, will anything change? Perhaps this experiment is valid, we are really doing what we will do for the rest of our lives. Fast forward to the last week of your life, look back on your life, does this thought make you happy? Today is all we have to change tomorrow, today is all we have to look back on tomorrow. Today is all we have to make things different from yesterday… if not today, then when? A small change of course on the open sea will greatly effect our final destination. If you can’t make a dramatic change in your life then at least work to make enough of a change that will make a difference at the end of your life. If you examine your activities for the week, which activities bring you true joy and happiness? Which activities are you likely to remember in 5 years? Which activities give you a sense of contentment and peace? Which activities make you feel good inside? Maybe contemplating a life purpose is not uppermost on our mind, but without some quiet reflection and thought, it will never be. Life really does go by fast and it moves faster every year you are alive. It’s not uncommon for people to lament that life indeed passed them by. I believe this is a function of allowing activities and routines to fill the space between birth and death, rather than consciously choosing a purpose in life and pursuing it with passion. This entry was posted in Calming The Mind Within, Manifesting - Conscious Creation, Self Awareness and tagged ego, Happiness, life, mindfulness, passion, self-awareness. Bookmark the permalink. This is another of your posts that I will read probably dozens of times. Your series on consciousness, for example, is now a mandatory weekly read for me. I’ve been through the exercise you suggested before, earlier this year, when I started waking up for life. And things became a struggle somehow. My soul screams whenever I do something that I see having absolutely no purpose. It is deafening! The only way to find solace and get my soul calmer is to every day take concrete steps in the direction of, exactly as you say, have the time and actually do what I am passionate about. Your soul reminding you a couple of times per day that what you do is not who you are is the best encouragement you can get. I’m not sure I agree with the statement that time passes faster every year, though. This year, for example, has been one of the longest ever for me. There’s so much happening, and everything so new, that I caught myself sometimes wishing for the time to actually speed up a little bit. When I’m doing something I love, time seems to actually disappear. Hours pass, you feel no hunger or thirst, you don’t feel tired and when you are done, it doesn’t feel fast, it doesn’t feel slow. Time just didn’t exist somehow. Saulo, it is a rare thing for a person to hone in on their purpose. I applaud you for being fully conscious of this at a relatively early age. Speaking to my comment on the passing of time, I am referring to a very general perception of time. As one gets older time does seems to move faster. This is due to a number of factors not the least of which is how consumed we become with our life. We forget to be mindful of life’s little pleasures. We forget to be curious. We no longer tend to explore and therefore take little notice of things around us. Perhaps the biggest reason however is we allow the ego to take control of our life. With the ego in control we spend so much time ruminating about the past with judgment, anger or guilt. The ego also fantasizes about the future or is fearful, worrying about things to come. 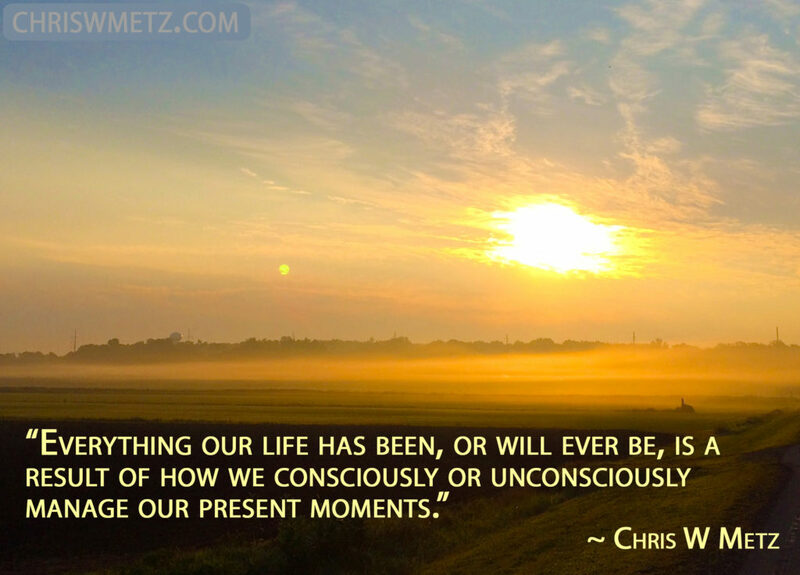 It is no wonder a day goes by so fast because we are hardly present in the moment. Your comment about how slow time is moving for you is a testament to a change in your consciousness. Upon becoming more awakened you tend to be fully present not allowing the ego to live in the past or future. It is clearly an indication of your mindfulness and being in the present. Ironically when we are fully engaged in an activity we are passionate about, time would almost seem to disappear. We don’t seem to be cognizant of time, but yet it goes past swiftly. I love your comments about time, I can relate to everything you said. I too experienced an almost timeless 8 months after my experience where time seemed to stand still. Coming up to the three year mark in an ongoing divorce I also wish sometimes that time would speed up. Once again it’s all good, everything happens for a reason and everything is happening for everyone’s higher purpose. Thank you as always for your comments and dialog.